Georgia doesn't have money for social services, but taxpayers gave $700 million for the stadium that's hosting tonight's Super Bowl. How long will NFL owners screw working-class Americans? As you’re watching Super Bowl LIII tonight at the cutting-edge Mercedes-Benz Stadium in Atlanta, Georgia, just remember why that stadium is there and who benefits most from it. The venue, home to the Atlanta Falcons, cost $1.6 billion to construct and opened in 2017. But the Falcons alone did not pay for their state-of-the-art, energy-efficient arena. 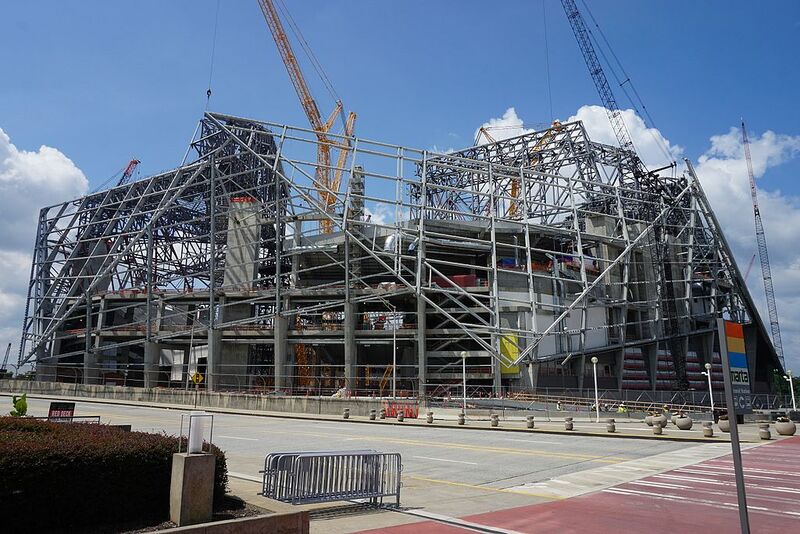 Georgians contributed $700 million to the project in taxes, despite the team’s owner, Arthur Blank, having an estimated $4.7 billion net worth, according to Forbes. While this deal between the state and the Falcons may sound ludicrous, it is part of a trend of billionaire NFL owners screwing over working-class Americans by extracting copious amounts of public money from them. Although publicly funded stadiums exist in all sports, the NFL is the worst offender. Since 1997, nearly $7 billion in public money has gone to building and maintaining NFL stadiums for the benefit of the league. NFL stadiums built in the past twenty years have received around $238 million in public funding, on average. The most recent case is in Las Vegas, where the state of Nevada agreed to contribute $750 million to help build a stadium for the Oakland Raiders for the team’s move to the city for the 2020 season. They made the massive investment despite Las Vegas already being ranked the second-most-popular tourist destination in the country by TripAdvisor in 2016. It was the largest government handout to an NFL team ever with the Falcons just behind them. Local politicians love taking “credit” for bringing a sports team to their area. In an era where Americans are forced to crowdfund their medical bills and urban infrastructure is crumbling, this is an absurd use of public money. NFL owners certainly don’t need such money to build their stadiums when their league is enjoying record profits. The 2016 and 2017 NFL seasons (the most recent data available) were exceptionally lucrative for the league. Its thirty-two teams split around $7.8 billion in revenue sharing following the 2016 season and more than $8 billion following the 2017 season, the latter of which worked out to around $255 million apiece. This does not even include profits individual teams made in sales made at their respective stadiums through tickets, concessions, luxury boxes, and more. They can clearly afford to build their own stadiums as the New York Jets and New York Giants did last decade (privately funding the $1.6 billion MetLife Stadium in East Rutherford, New Jersey). But for perhaps obvious reasons, most NFL teams would rather take money from public coffers. For the owners, it’s a great arrangement; they accept these bribes from politicians and receive massive public funding on a venue which they use to make hundreds of millions of dollars per year. Meanwhile, the local constituents see no benefits from the bargain — and often actually end up worse off. But if such a deal does not work out well, don’t expect NFL teams to take any accountability for what happens. The state of Missouri knows this firsthand with the Rams back in Los Angeles. The team relocated to St Louis for the 1995 NFL season under the condition that the state pay $280 million to build the Trans World Dome (now known as The Dome at America’s Center) which they would, in turn, lease to the Rams. However, the Rams ditched the venue and moved back to LA following the 2015 season, leaving behind $144 million worth of debt to be picked up by Missouri, which now has a 67,000-seat venue with no permanent tenants. It will have an XFL tenant in 2020, but even that will only work out to $100,000 per game plus concession and stadium-parking profits. A common argument in favor of states and local municipalities funding NFL stadiums is job creation. But while it takes infrastructure jobs to build a venue (though these jobs are temporary) and game-day staff for these facilities to operate, the point is futile. NFL teams barely even use their stadiums. They play eight Sundays per year during the regular season, twice in the preseason and, if they are lucky, for an additional postseason game or two. Even with the occasional concert, soccer game, or other special event mixed in, stadiums are not in use for the overwhelming majority of the year. Wired claims some NFL stadiums are used as few as twenty times per year, factoring in special events. And the jobs these stadiums do create mostly exist on game days, providing low-wage labor. The most common jobs include cashiers, vendors, custodians, ushers, parking attendants, ticket takers, cooks, and security guards. Levi Stadium, home of the San Francisco 49ers, uses 4,500 workers on game days but full-time, the venue employs just sixty people. The gam-eday employees, who work just a handful of days per year, do not receive anything near a living wage. In 2014, their average wages ranged from $13 to $26 per hour, well below the average $31.61 hourly wage in the Bay Area at the time. Not to mention, the NFL often hires far fewer infrastructure workers to build stadiums than they initially promise. While 25,000 were projected to build the NFL’s Las Vegas stadium when the initial agreement was made, the actual figure turned out to be just around 3,000. If the state wanted to create a worthwhile infrastructure project, perhaps it would have made more sense to work on public goods like roads, bridges, public transportation, and more while employing as many people as possible. There are far better ways for governments to spend money and serve the needs of their people than giving it away to billionaire NFL owners. Tom Joyce is a freelance sports and culture writer from Massachusetts. He has written for the Boston Globe , HuffPost , and other outlets.